Georgia small businesses will find it easier to interact with state government under regulatory reform initiatives announced today by Governor Sonny Perdue. "Our small businesses are the backbone of Georgia's economy, and these reforms will assure they continue to thrive in our state," said Governor Perdue. "I commend our state agencies for working in close cooperation to ensure that Georgia's small businesses experience a more efficient means of assistance and a higher level of customer service." A small business liaison from each state agency has been selected. Small businesses are able to go directly to this person for quick responses to each query regarding regulations for that particular agency. A new toll free number has been established: 877-REGS-4-GA (877-734-7442), where calls will be directed to the proper agency liaison. A new website has also been developed: www.regs4ga.org , where Georgia businesses can find specific regulations and related helpful resource links. A tracking procedure to identify the issues, questions and trends of most concern to Georgia's small businesses has been established. Agency liaisons report their findings to ESBO each month. These findings could lead to streamlined rules and regulations, or legislation if necessary. An annual progress report will be submitted to the Governor. Governor Perdue announced the reforms today during an observance of National Entrepreneurship Week, a nationwide celebration of entrepreneurs to be held Feb. 24 - March 3, 2007. The Governor also presented a proclamation supporting the goals and ideals of the national event and the importance of entrepreneurship to Georgia's economy. In addition, the number of businesses owned by women in Georgia grew 35 percent between 1997 and 2002, the second-fastest rate in the country. Women-owned businesses are the fastest-growing business segment in Georgia. The "Entrepreneur Friendly" program, an official designation that means a community is strategically developing an environment that welcomes small businesses and entrepreneurs. Entrepreneurs and small business owners in these counties are also eligible to receive free, customized market data to enhance their competitiveness. Currently 33 Georgia communities have received the certification and more than 50 are in the process. The Entrepreneur & Small Business Regional Project Management team. This team of 10 small business specialists is in its second year. Spread out throughout the state, this team focuses on assisting small, fast-growing companies, many within Georgia's strategic industries, with resources that can assist them with expansions and new investment. The team also works closely with Georgia's Centers of Innovation and facilitates the "Entrepreneur Friendly" designation. The Governor's Mentor Protégé Program, Georgia's business-to-business mentoring program, and the first state-operated program of its kind in the nation. Since the program's inception six years ago, more than 125 small companies have increased their chances of success through mentoring by established, prospering corporations. The Entrepreneur & Small Business Coordinating Network, established in 2004 by Governor Perdue, assures statewide support for small businesses with 28 state, federal, non-profit and private sector partners. The US-China Connection, Inc. and Global Achievers once again will organize a group to visit China during October 7 thru October 20, 2007! This time, we plan to take 14 days and to travel to following cities: Beijing, Xian, Chendu, Jiuzhaigou, Hangzhou and Shanghai. Please read the detailed travel plan. n Gate admissions to all scenic and culture destinations listed in the travel day- by-day schedule. n Transportation between the traveler’s home and the airport in Atlanta. n All personal costs such as laundry, certain beverages, telephone bills, postage, pay per movie costs and travel insurance if desired. Please note that voluntary non-usage of meals and admissions will not refundable or exchangeable. 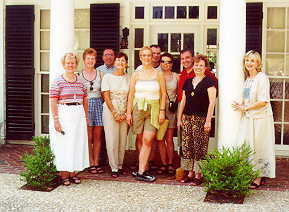 For an Itinerary click here. On June 5, six visitors arrived from the Belfast area of Northern Ireland for an exchange visit after a group from Global Achievers visited them in May. Three teachers and three administrators met with education and government officials to firmly establish a partnership between Craigavon schools and schools in Georgia. LaGrange High School, Troup County Comprehensive High, and Starr's Mill in Fayette County will be matched with Portadown College, St. Michael's Grammar School, and Lismore High School for the next school year. While here, they also toured sites such as Callaway Gardens, the Little White House in Warm Springs, the Carter Library and Museum, and the Martin L. King, Jr. Historic Site. In addition, Mr. Aidan McCormick of the Southern Education and Library Board of Northern Ireland made a presentation to Rep. Jeanette Jamieson and Rep. Lynn Smith at the Georgia State Capitol on June 10. He emphasized the need for entrepreneurial programs such as Global Achievers in the economy of the 21st century for all countries. Students in these programs on both sides of the Atlantic will do market research to discover products that > may be exchanged in their students companies. 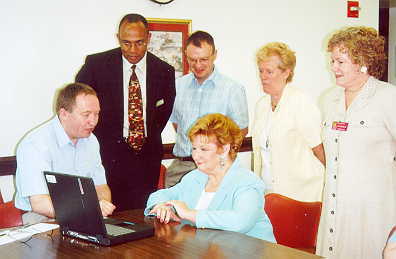 Enterprise for Life Conference was held in Nottingham, England, on May 13-15, 2002. Representing Global Achievers were Bette Hickman, Executive Director, and Janie Lore, Principal at Central Educational Center, and Ellen Latimer, Global Achievers Cooordinator at Central Educational Center. 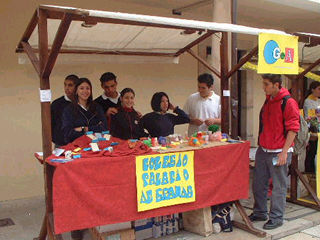 They presented "Preparing Young People for the Global Economy of the 21st Century." The conference was the first event in Nottinghamshire's Enterprise for All Project which seeks to address the poverty of aspiration and risk-averse culture that prevents people's achieving their potential and making the most of the opportunities around them. 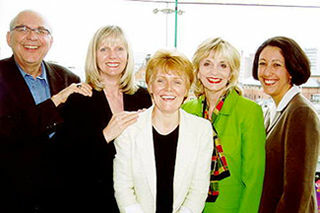 Eugene Luzckiw, Director for Enterprise Education, Toronto, Canada; Beverley Burton, No Limits Education and Training in Nottingham; Norma Black, Course Director and Founder of the Learning Game from Scotland; Bette Hickman; and Lynne Bianchi, Science Educator and Researcher of Sheffield Hallam University. 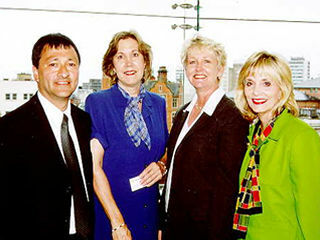 Peter Nangle of Blackburn College, Blackburn, England, partner of CEC; Ellen Latimer and Janie Lore of CEC and Bette Hickman. May 31 was Market Day in Oviedo, which is in the northern part of Spain near the Atlantic Ocean. 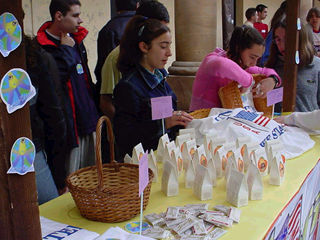 Several schools in this area called Asturias have been partnered this year with Global Achievers schools in Georgia and North Carolina. Videoconferencing and e-mails were used extensively among the schools, and they also made product catalogs of goods available for sale. This first year of partnership has proven to be very successful and both sides are looking forward to an even more active year in 2002-2003. The first photo is an overview of the market with approximately twenty booths. Roll the mouse over above image to see 360° marketplace. . .
Sandy Creeek High School in Tyrone sent "United We Stand" t-shirts and peachbuds candy as well as other items. Kennesaw Mountain High sent sweatshirts and jewelry and Columbus High School exported lotions and soaps. In addition,Calhoun High School exported many native American items such as dreamcatchers and jewelry and imported beautiful leather handbags. In addition, Dodge County High School exported small stuffed animals called "Smoochies" and candy such as Goo Goo clusters, pecan logs, and peanut brittle. The Sixth Annual Golf Tournament sponsored by Global Achievers on Wednesday, April 10, was a great success-with the sun coming out after a rainy week. Michael Murray of East Ayrshire, Scotland, joined the group at Orchard Hills Golf Club in Newnan, and Richard Smith piped "Amazing Grace" as well as several other Scottish tunes to begin the playing. 58 players joined in a beautiful afternoon and enjoyed barbeque and stew at the end of the day. Teams from LaGrange, Griffin, Fayetteville and Newnan were present for the event. The first place winners were Harold Hammond, Bill Hammond, David Helton, and Toby McSwain. In second place were John Thrasher, Dan Kazmierczak, and Bob Dean and Gary Shepherd. Third went to Don Pierce, David Lamb, A. Canote, and Derrick Howard. George Barron received the Closest to Pin Prize and Bubba Johnston was the winner of the Longest Drive. Sponsors included Chateau Elan, Sky's Flying Service, Belk Department Store in Newnan, N-Vision Studios, Best Western Little White House Inn and the Chipley Murrah Bed and Breakfast in Warm Springs, Bleyle-Loftin Group, Bank of Coweta, SouthTowne Motor Company, Woodbury Banking Co., Crain Oil Company, Coweta Greenhouses, MONY of Griffin, and Harwell, Brown, & Arnall, P.C. Our thanks to all who participated in this worthwhile event for Global Achievers. The First Annual Evening with Robert Burns sponsored by Global Achievers at the Newnan City Hall on Tuesday, April 16 was a great success. It was a pleasant evening---with musical selections, poetry recitations, story-telling as well as artwork by Young Artists of Newnan and Coweta County and masks made by students of Mrs. Gail Zoeller from Elm Street School. Ms. Sue Brown of Elm Street played "Auld Lang Syne" for the finale. Michael Murray of Scotland read selections from Robert Burns and Cathy Wright of Newnan presented a Joel Chandler Harris "Uncle Remus Tale" in dialect. Winning selections of artwork will be presented by Bette Hickman at the World Federation Competition to be held in Cupar, Fife, Scotland on Saturday, April 27. Refreshments representing the South and Scotland were provided by Teri Lewis. Student performances by children from Northside School and Arbor Springs as well as art from Elm Street were highlights of the evening. Ms. Shelley Recesso of S.L. Mason Elementary School in Valdosta sent artwork from her students as well as gifts for the partner school, St. Anthony's in Saltcoats. Ms. Nancy Royal and Mr. Robin Merriman of Ruth Hill School and Mrs. Anne Powell and Lori Boyd of Smokey Road Middle as well as Dr. David Gregory of Elm Street were in attendance. Mayor Keith Brady gave the welcome emphasizing the Sister City relationship between Ayr, Scotland, and Newnan as well as the commonality of our two cultures. Two members of the Atlanta Burns Club were present as well as representatives from the local government and education community and parents. Global Achievers expresses appreciation to the Burns Celebration Committee, Angele's Gallery and Framing, Bodacious Foods, Inc., Dr. Gerald Troutman, and Newnan Utilities for assisting with this event. We look forward to increasing the participation for the Second Annual Burns Evening in 2003. Bette Hickman, Executive Director of Global Achievers, organized a study tour to Scotland and Northern Ireland to visit partner schools and to meet with various education, cultural, and government officials. Through the Achievers International office in Ayr, Scotland, school partnerships were established last spring between several schools in Georgia and schools in the Craigavon area of Northern Ireland. The Northern Ireland initiative is a part of a grant to Global Achievers from the Callaway Foundation. Students, teachers, administrators, business and government leaders were represented on the study tour. The visit also focused on strengthening and expanding existing ties between Newnan and Coweta County and the Ayrshire region of Scotland. In June teachers and other officials from Craigavon will visit LaGrange as well as in Fayette County and Coweta County. 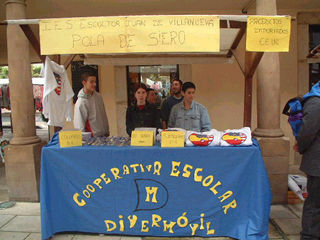 Geraldine Welch, Associate Director of Global Achievers, recently met for several days in the Asturias region of Spain with the leaders of the Valnalon Project (See www.valnalon.com) who coordinate the partnerships established with Global Achievers. Mr. Jose Antonio Vega, Mr. Jose Manuel Perez Diaz, and Mr. Ivan Diego coordinated the visit. Schools having partnerships in Spain include Sandy Creek High School in Tyrone, Dodge County Elementary School, Eagles' Landing High in Henry County, Kennesaw Mountain High in Cobb County, Calhoun High in Calhoun, Columbus High School in Muscogee County, and Cabarrus County High School in Concord, North Carolina. Ms. Welch also met with educators and the deputy mayor of Aviles, Spain, to establish a partnership with schools in that city. The sister city of Aviles is St. Augustine, Florida, and several visits have been made over the years because of this relationship. The fall of 2002 was the first time Achievers groups were established with Spain and it has proven to be a very rewarding experience with videoconferencing among many of the school groups. Global Achievers looks forward to much growth with the students and teachers in this northern area of Spain.